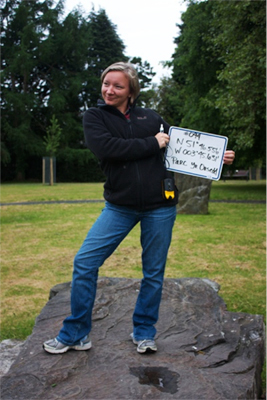 A class of students from Appalachian State University traveled to Wales for a summer study abroad program in June of 2013. The Wales study abroad program has been coordinated by the Center for Appalachian Studies at Appalachian State University since 2001. This summer, students started a project to map historic sites in former mining communities in South Wales. This is the first in a series of three blog posts written by the students about their experience. On one of our group’s first days in Wales, we all piled into our mini- bus to ride down the hill into the village of Ystradgynlais. It was our first exploratory mission to find points of historical and cultural interest to map on TrailMaker, the smartphone application we used to map historic sites in South Wales. Upon arriving in the village, we split into teams of two and set off in all directions. With us, we carried a camera, a GPS plotting unit, a marker and a dry erase board to record what we would find. The first site my team first came across was a small park with a strangely stonehenge-esque feel to it. By that I mean that the center of this park held a large circle of standing stones, each close to 6 feet tall. In the center of the circle was a platform of sorts, also constructed of the same large stones. Perplexed and still slightly jet-lagged, we decided that this was definitely worth plotting. As we wrote out the coordinates to be photographed, Kathryn, my teammate and our class’ graduate assistant, and I exchanged guesses as to what this deliberate mass of stones could be. The Welsh signage, “Parc Yr Orsedd” didn’t convey much in the way of clues. As we climbed about and theatrically posed atop the central mass of stones, I kept returning to the thought that perhaps this was a sundial, without once considering that it was meant to be the stage we were using it as. More than a week later, I still didn’t have answers, so when the class divvied up the points we’d collectively plotted, I was quick to claim the Parc Yr Orsedd (Gorsedd Park) as one of my research projects. My quickly-googled query of “Gorsedd Park” led me to discover that similar monuments, called Gorsedd Stones, appeared all over the Welsh countryside. This discovery, in turn, brought to my attention something called an Eisteddfod, which apparently happens in a different location across Wales every single year! It turns out that Eisteddfod is a uniquely Welsh festival of literature, music, performance and craft. The National Eisteddfod provides an opportunity for Welsh people to compete and display their artistic talents and skilled craftsmanship, and all ceremonies are conducted exclusively in the Welsh language. There is a certain pageantry to elements of the Eisteddfod, including the Gorsedd, the name for the assembly of the Bards of the Isle of Britain. Eisteddfod is a time when the Welsh poets (bards) gather to celebrate and crown the laurel winners for the year, and this gathering always takes place in and around a circle of large standing stones. Upon uncovering this information, in my mind’s eye I suddenly saw the stone stage in Gorsedd Park for exactly what it was in 1954, the year that Ystradgynlais hosted the National Eisteddfod. 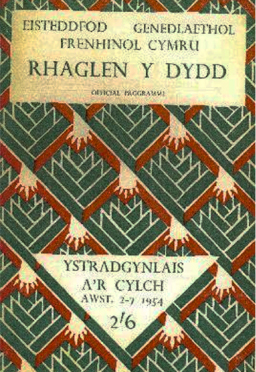 The program for the 1954 National Eisteddfod in Ystradgynlais. 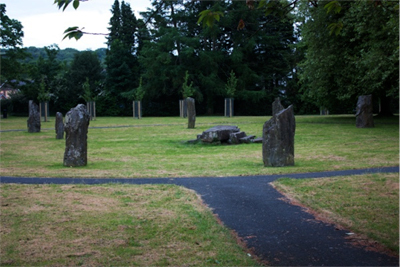 It isn’t unusual for the Gorsedd stone circle to be left standing after an Eisteddfod to commemorate the honor bestowed upon a town by hosting this cultural event. In 1957 the green lawn that houses the Gorsedd stones was opened as a public park and is now also home to the Ystradgynlais Roll of Honour and War Memorial dedicated to the villagers who lost their lives in the World Wars of the 20th century. The park sits on the eastern side of the Tawe River and backs up to St. Cynog’s Parish Church, the oldest place of worship in all of Ystradgynlais. Today, Gorsedd Park is used for dog-walking, picnicking or catching some rays on a rare sunny day, but it also remains a glimpse into Welsh culture and serves as a reminder of the ways in which Welsh history lives on in the present day.